I’m Paolo. And I’m Margo. This year we’re traveling around the world to learn about children of God. Join us as we visit the Philippines! About a hundred million people live in the Philippines, along with a lot of interesting animals! Eight major languages are spoken in the Philippines. This Book of Mormon is printed in a language called Cebuano. How do you get to church? Some Filipino families ride jeepneys to get around! This is a CTR ring in a Filipino language called Tagalog. Here’s how to say “choose the right”: piliin ang tama. These are the temples in Cebu City and Manila. And guess what? A second temple is being built in Manila! And temples will also be built in two more cities, Urdaneta and Cagayan de Oro. Filipino children play a game called luksong tinik, or “jumping over thorns.” One or two children sit on the floor and stack their feet and hands on top of each other. Then other kids try to jump over without touching the stack. 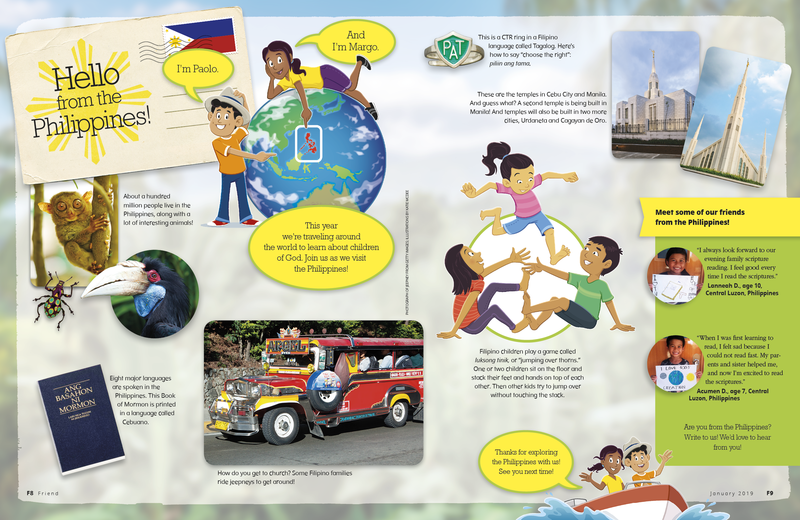 Meet some of our friends from the Philippines! Are you from the Philippines? Write to us! We’d love to hear from you! Thanks for exploring the Philippines with us! See you next time!